SEAMAN JOB INFO - NAESS SHIPPING PHILIPPINES, INC. 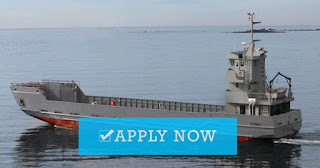 Available domestic seaman hiring for Filipino seafarers crew working in domestic LCT vessel. NAESS SHIPPING PHILIPPINES, INC. was born on October 24, 1980 with the signing of the documents by Capt. Pablo Gutierrez and Mr. Arturo Piree at the Army Navy Club in Manila. Our first office had a staff of merely five employees at the mezzanine of the Pennville Building on Leon Guinto Street, Malate, Upon approval and registration with the Securities and Exchange Commission, in December of the same year, initial manning operations began with a modest number of 25 vessels. Within three years, we were able to acquire and transfer to our own office at 2215 Leon Guinto St., Malate. Share to help other seaman looking jobs at sea. Get a maritime & offshore jobs guide. Family life insurance company. Free finance courses. 0 Response to "3rd Engineer 2x For LCT Vessels (Philippines)"